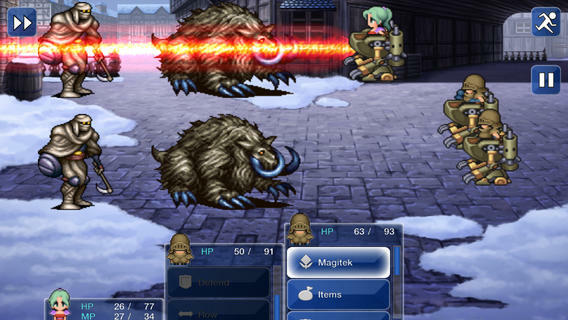 Back in October, Square Enix director and producer Takashi Tokita confirmed in an interview that the Final Fantasy VI game will soon be released for iOS, as a modified version of the Final Fantasy VI game originally released in North America in 1994 as Final Fantasy III. Today, the game has been officially released in the App Store as a universal download ($15.99) for iPhone / iPod and iPad devices. The story is based upon a young girl named Terra whom the evil Empire has kept enslaved in an effort to harness her power as weapon. This leads to a fateful meeting between Terra and a young man named Locke. Their harrowing escape from the Empire’s clutches sets in motion a series of events that touches countless lives and leads to one inevitable conclusion. Game data saved with iCloud can now be shared across devices! At home or away, on your iPhone or iPad, pick the play style that’s best for you. Square Enix has previously said that the Final Fantasy series won’t necessarily end with VI, noting that if this Legacy project works out well, they would surely be able to work with Square Enix VII for iOS.